That means students who attend a community college and transfer to a four year institution can save significantly on tuition and have fewer student loans to pay off when the time comes to graduate. Likewise, students who exit a community college with an associate’s degree still get a significant boost in the workforce, earning an average of $10,800 more than workers with only a high school diploma or GED, according to U.S. Census data. 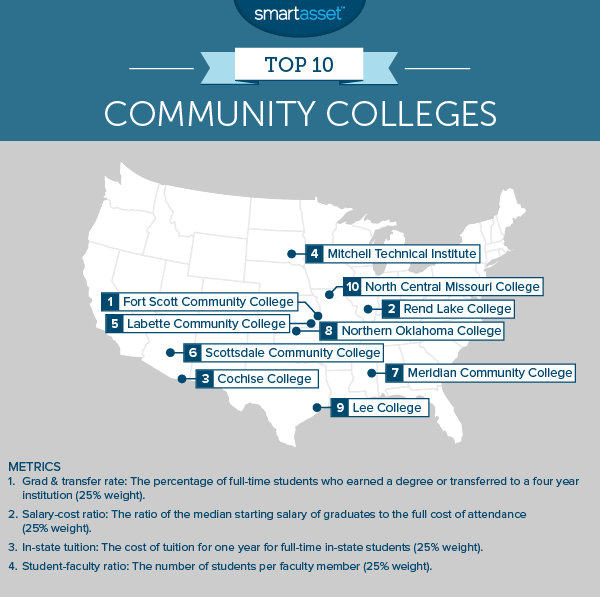 This is SmartAsset’s second annual study of the nation’s best community colleges. See the 2014 version here. The national import of two-year colleges was evidenced in the recent discussion surrounding a presidential proposal that community college be made free for anyone who wants to attend. Two states, Tennessee and Oregon, have already done just that. Even in states where community college isn’t fee, however, many students are getting great value for their community college dollar. Try SmartAsset’s super-smart student loan calculator. Kansas, Arizona schools rate well. Kansas and Arizona each claim three of the top 15 spots in SmartAsset’s ranking, with Kansas’s Fort Scott CC taking the top overall spot. Northeast gets an F. Only two northeast states have any of the nation’s best community colleges (Maine has three and Massachusetts has one). Notably absent are New Jersey, Pennsylvania and New York, which boast a number of the nation’s top four-year schools, but no top community colleges. So what makes Fort Scott Community College so great? The school’s graduation-or-transfer rate is an incredible 87%, double the average for the colleges in SmartAsset’s study. One reason so many students find success at Fort Scott is that the student-teacher ratio is just 12:1. Rend Lake is one of 48 schools in the Illinois Community College System. The average Rend Lake graduate has a starting salary that is 1.3 times the full cost of school. Rend Lake also has a number of athletic teams, called the Warriors, which are part of the National Junior College Athletic Association. Among the sports in which they compete are basketball, cross country, golf and track & field. The men’s cross country team has won several national championships over the past 15 years. Mitchell Technical Institute offers associate’s degrees in fields such as agricultural technology, satellite communications, wind turbine technology and radiation therapy. While the school’s tuition and fees are above average, totaling about $4,300, students can expect to quickly pay off any student loans. The average MTI grad goes on to earn a starting salary 1.08 times the total cost of getting a degree. Initially founded in 1923 as an extension of the local high school, Labette Community College has since developed into an accredited community college, granting degrees in everything from physics to nursing. It has a student body of about 1,200, most of whom attend class at the main campus in the town of Parsons, in southeast Kansas. The school’s successful completion rate of 72% ranks ninth in the country. For the second year in a row, North Central Missouri College ranks among the top ten community colleges in the nation. Graduates of NCMC enjoy an average starting salary that is 45% higher than the total cost of getting their degree. That’s the seventh highest ROI in the country. Read the 2016 version of SmartAsset’s study of the best community colleges. 1. The data used in SmartAsset’s study comes from the National Center for Education Statistics and collegemeasures.org.